Add blue color to lakes, ponds, water hazards, or large fountains. As low as $14.75 for a pint. Gallons are $21.99 less per gallon than Aquashade...save even more with our gallon packs! 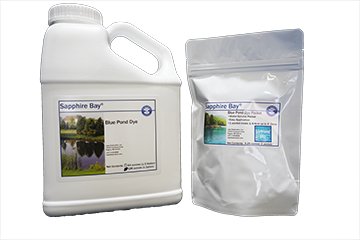 Sapphire Bay® blue pond dye adds a natural looking blue color to lakes, ponds, and large fountains. I ordered this thinking it would take a week or so to color. I was WRONG, I walked around my entire lake pouring a little every 15 ft. in about 4 hours the entire lake was a fresh looking deep blue color. buying another gallon because my lake was a bit bigger than i originally though. VERY HAPPY WITH THIS PRODUCT. It did a great job on our 1 acre pond. Very easy to apply with a sprayer and the entire pond was blue within hours.